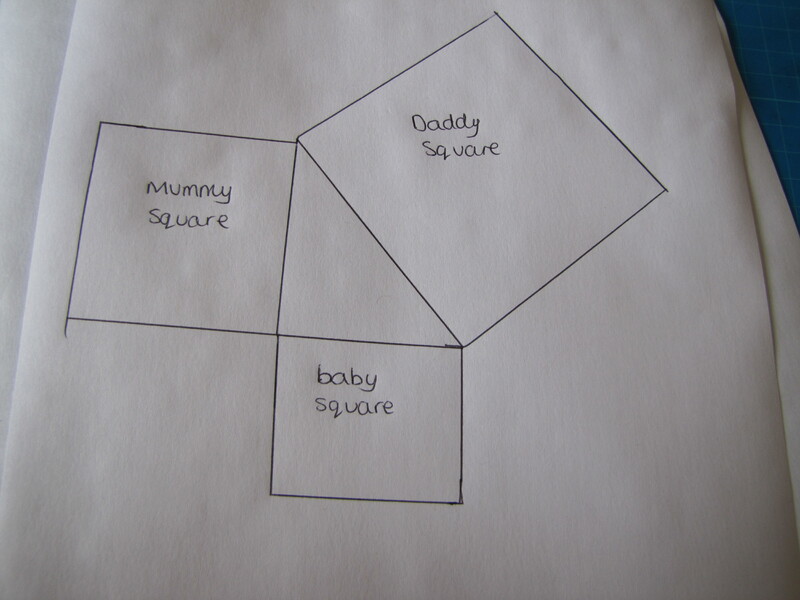 This is the sotry of 3 squares, Mummy Square, Daddy Square and Baby Square. They live on the edges of every right angled triangle in the whole wide universe, but you can’t usually see them. Daddy square’s real name is Hypotenuse, it’s Greek. 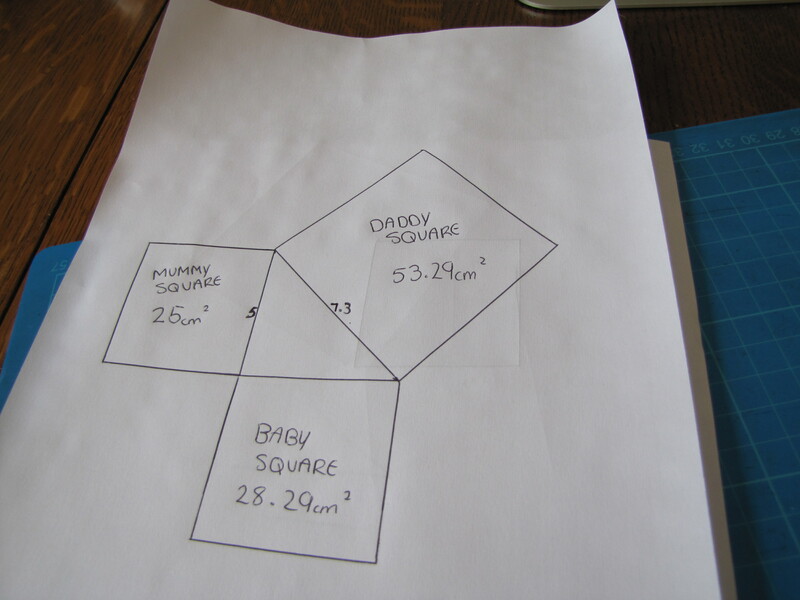 If you add together the areas of baby square and mummy square, you always get the area of Daddy square. If you know the sizes of two of the family, you can always work out the size of the third one. 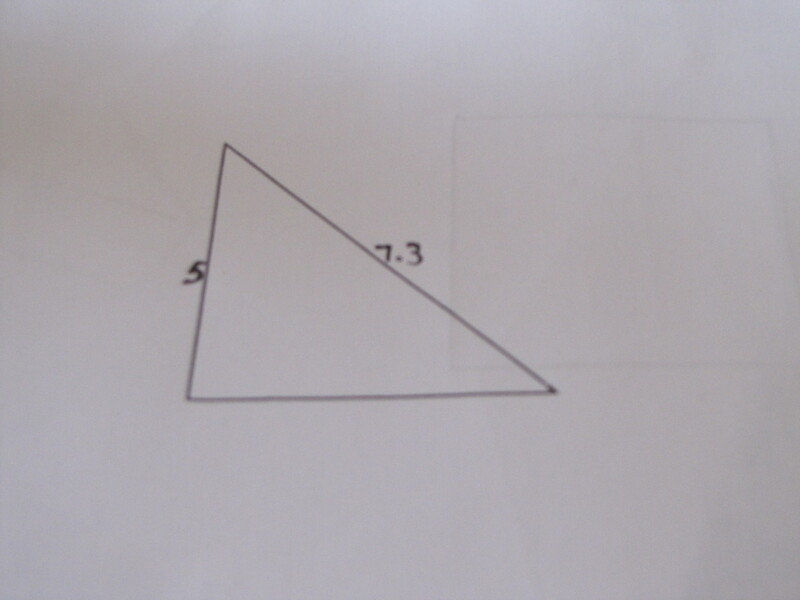 Once upon a time there was a right angled triangle. One side was 5cm, another was 7.3, and a donkey wanted to know how long the other side was. 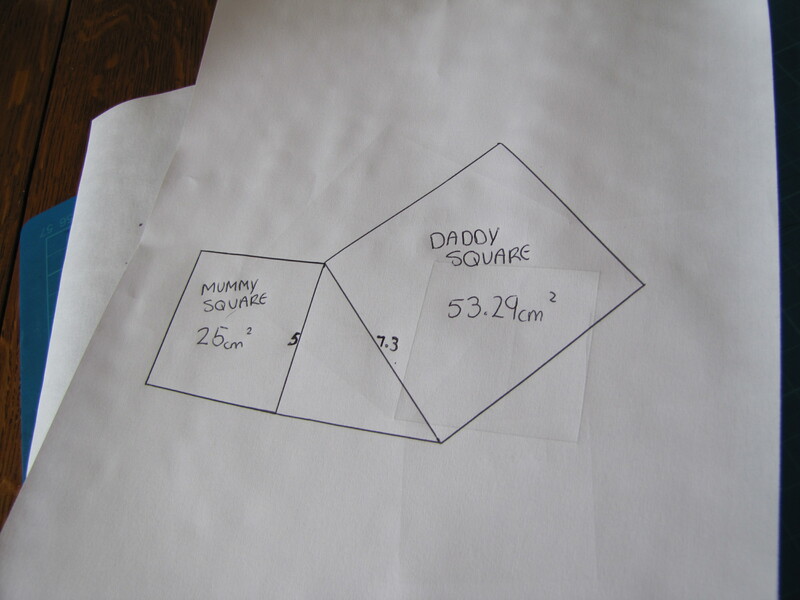 So, the donkey drew Mummy square, (area 25), Daddy square (area 53.29) and Baby Square (area unknown). The area of Baby Square must be 53.29 – 25 = 28.29. (Not easy to manage a calculator when all you’ve got is hooves). 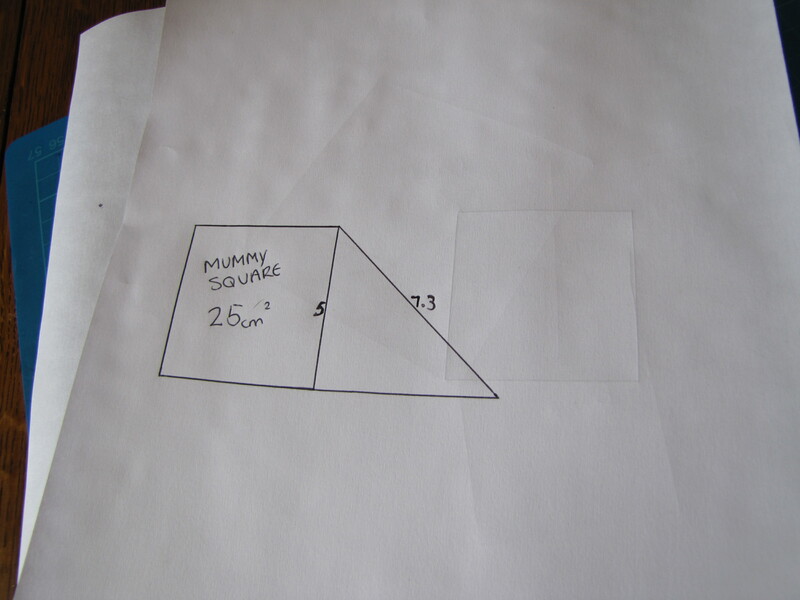 So, if the area of Baby SQuare is 28.29, the length of the baby side must be the sqaure root of 28.29. 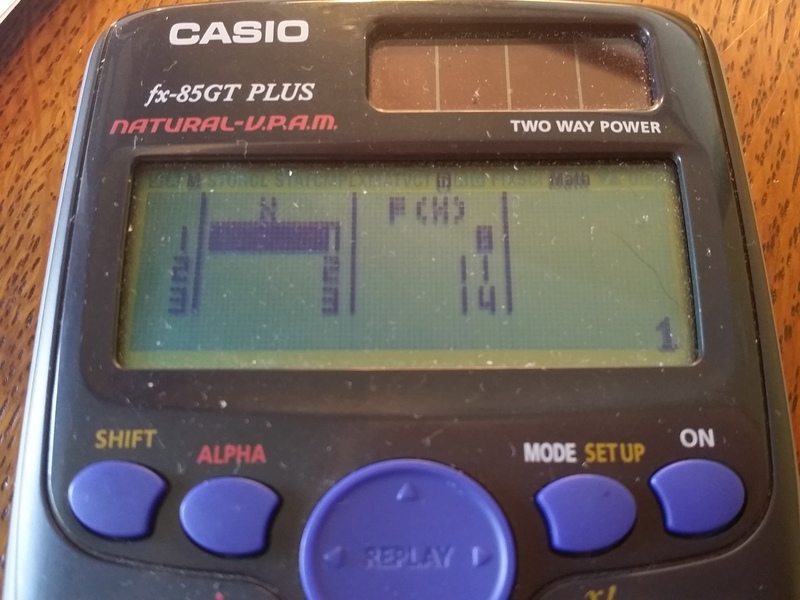 Donkey’s calculator says this is 5.318834459 but Donkey knows that that is TOO MUCH INFORMATION (TMI) and it’s enough to say 5.32 as the answer. Any Donkey who wants to get good at working with the Three Squares will need lots of practice. Then, take your pick from this Google Search page, and practice! Look for websites where you are given the questions and the answers, so that you can check you are getting things right. A game for 2 players. The winner is the player with most points at the end. Play a game with the 13x table. This is almost completely unfamiliar and the kids will be intrigued. The KEY fact is that 7×13=91 because 91 is a terribly prime-looking number but it isn’t. Pupils who are confident with their other tables will, by learning this factorisation, have completed the full set of skills in factorising numbers under 100. Make sure the players can factorise a number using their calculator. On the CASIO fx-83gt PLUS this is done by entering the number, pressing equals, SHIFT and ., ,,, (this has “FACT” written above it in yellow). The Prime Factor Form is displayed as the answer. Roll 2 (or 3) dice, and choose which number to build. For example, a 5 and a 1 could be 15, 51 or 6. Factorise your chosen number. The score is the number of prime factors. eg 15 would score 2 for 3×5. 8 would score 3 because it is 2 cubed. 24 scores 4 because it is 2x2x2x3. 71 scores 1 because it is prime. ** You may need to explain the “Index Form” that the calculator displays. This is a very important notation anyway, which a lot of students misunderstand. Once they know a number will divide, they have to actually DO it mentally. Practice makes perfect here! A printed tables sheet may be a help. In their enthusiasm to win they are stretching their own mental maths to the limit. If they don’t fully factorise both numbers, they may miss a high score! A younger pupil may want to try all the possible numbers with the calculator – this is good practice anyway and reinforces the correct factorisations. An enthusiastic player will start to memorise some of the factorisations – this is really helpful knowledge. A4 Card – the best type has one coloured side, the other white – cut into tenths. You will need 3 or 4 pieces per pupil. Walk the class slowly and carefully through the key presses needed to put the calculators in TABLE more. (Mode 3) – like all ICT inputs, some will inevitably get lost and panic – this is where it’s important for them to be used to getting support from each other. For “Start”, stick to 1 all lesson. Ask them to describe what they can see. Including the column headings. Remind them to “mouse” down to see the bottom section of the table. Write the F(X)=10 and the sequence on the board. Press AC to clear the table and start again. This time try F(X)=12. Ask how they could make it more interesting, let them experiment. My lot came up with larger numbers but still the whole sequence was all the same number. How can you make the numbers change? Someone might already know – discuss and try F(X)=2X. This is achieved by keying in 2ALPHA (= because the ( button has X above it. Describe and write on the board the sequence this creates. Give out 2 pieces of card each. Create your choice of sequence, write it on the coloured side of the card. On the back write F(X)= and the function you used. Discuss boundries – numbers under 10. (I should have set more – no decimals and no division yet. But it did make life interesting! If you think any of them are quite difficult, give them one or two stars. This will let the pupils self-differentiate. Put the cards down SEQUENCE SIDE UP and the pupils choose which one they want to do. Try to guess the F(X), key your guess onto the calculator, can you make that exact sequence? Once you have made it, turn over and check the rule on the card. Then initial the front of the card to note that you have done it. What was easy? What was more challenging? Do we need another lesson on this (My group decided they found the minus ones harder so we pencilled in a lesson on handling negative numbers.